This project provides helpdesk support for technical problems encountered by Australian grapegrowers and winemakers. Support includes identifying the root causes of problems, and providing research-based, practical, up-to-date remediation solutions, as well as future prevention strategies. This service also ensures that Australian grapegrowers and winemakers are competitive on the world stage, by having the latest technical information readily to hand. Investigative services, including analysis of problem grapes or wine, are conducted when a problem cannot be solved through discussions with the producer. The majority of the winemaking enquiries received during the year were from wine companies and suppliers actively aligned with the wine industry, with a small number coming from government organisations, students, legal practitioners and journalists. Approximately 17% of winemaking enquiries resulted in investigations, with samples requested and analysis performed to identify the problem and recommend a solution. 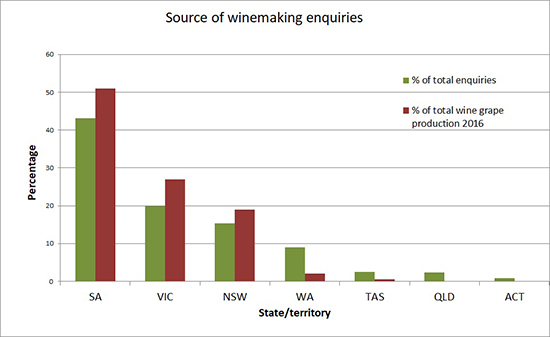 Figure 2 shows the sources of winemaking enquiries in relation to the proportional volume of wine-grape production for each state/territory. During the year, the viticulture team responded to 402 viticulture-related enquiries. The largest proportion of these related to sustainability and included advice on environmental management. Of the remaining queries, agrochemicals continued to be a priority topic for growers. Questions about the use of iprodione were relatively common as growers and wineries sought clarification on the regulatory changes occurring in the EU. The helpdesk also received a higher than average number of calls about leaf damage from suspected herbicide drift. Both of these issues prompted communications to industry via eBulletins. There were 85 regulatory-related enquiries during 2017/2018. These covered the broad areas of allergens, general food safety/toxicology, heavy metal content of grapes and wine, and legality of compounds, practices and processes. 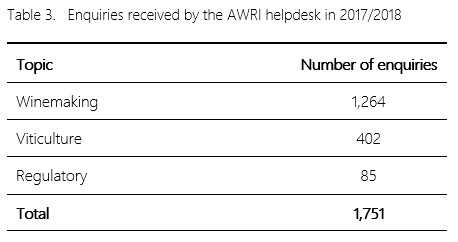 In 2017/2018, the helpdesk team conducted 213 winemaking problem-solving investigations, which is slightly higher than the previous year (208), and consistent with the 10-year average. The number of samples analysed as part of these investigations increased slightly compared to last year (Table 4). A breakdown of the investigations conducted by state/territory is shown in Table 5. 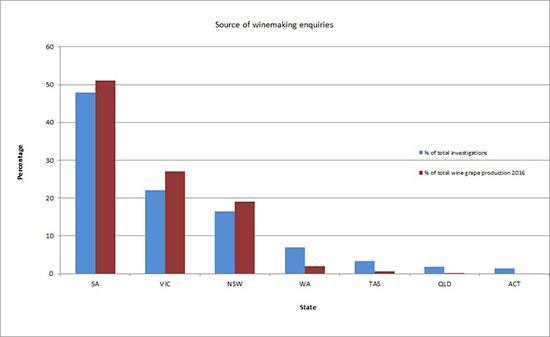 State-based usage of the service is similar to previous years, with SA accounting for the highest number of investigations, followed by Victoria, NSW and Western Australia, which generally aligns with the volume of wine-grape production of the different states/territories (Figure 3). 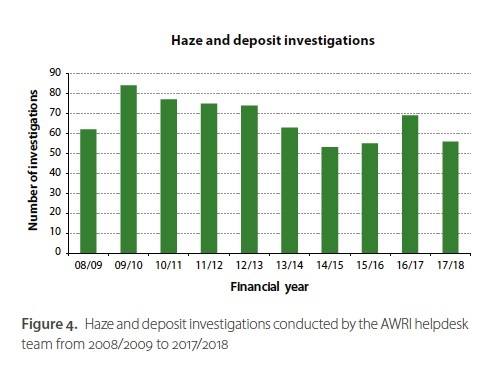 The number of haze and deposit investigations conducted by the helpdesk team remained significant (Figure 4), making up more than a quarter of all winemaking investigations conducted during the year. The type and nature of the hazes and deposits varied and ranged from yeast and bacteria to bottling line lubricants and grease. Crystalline deposits were again common, making up approximately one-third of all deposits identified. Potassium hydrogen tartrate was the most commonly isolated crystalline deposit, followed by calcium tartrate. Another common haze or deposit identified was protein from wines that had been insufficiently bentonite fined and were heat unstable. 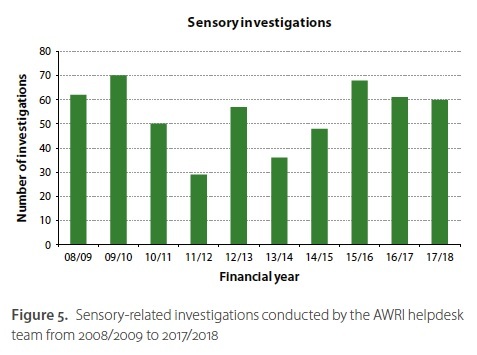 The number of sensory-related investigations conducted by the AWRI helpdesk continued to be significant, with 60 investigations this year (Figure 5). One-quarter of these concerned the common winemaking faults sulfides and microbial spoilage, while others included poor colour, ‘green fruit’ characters, acidity issues, smoke taint, oxidation, unwanted eucalypt character, oxidation, indole, leesy characters, bitterness, millipede taint and pinking. 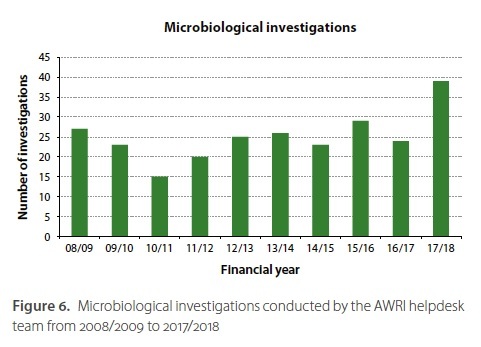 The number of investigations of microbiological issues increased significantly this year, with 39 investigations conducted, compared to 24 the previous year (Figure 6). Brettanomyces growth and spoilage was the most common problem, with 20% of the investigations relating to this spoilage yeast. A similar number (18%) of investigations concerned wines that had refermented in bottle causing elevated carbon dioxide and spritz. There were three investigations of mousy wines, and seven investigations where elevated volatile acidity had occurred through bacterial growth. 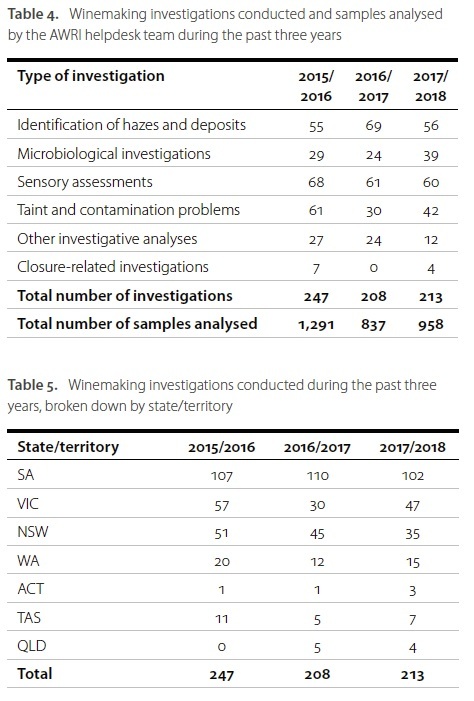 There were approximately 40% more investigations of taints and contaminations this year compared to last year (Figure 7). These included wine affected by 2,6 dichlorophenol-tainted bentonite, millipede taint, musty characters including trichloroanisoles, and contaminations from bottling line lubricants, cleaning chemicals and hydraulic oil.